"Don't mix spirits with spirits. " 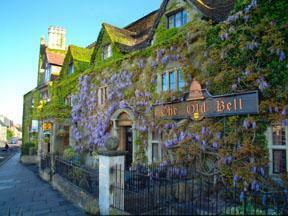 The most haunted hotel in Wiltshire is none other than the Old Bell Hotel. Not only is this considered to be one of the most haunted hotels in England, it is also the oldest hotel in the region. This beautifully designed and purpose-built structure contains many different features that attract visitors from all around the world. First, it has a large number of exquisitely designed corridors that draw the attention of guests. Next, it contains many different beautifully structured guests’ houses. It also contains a brasserie, a restaurant with many different menu options, as well as a bar. Best of all, it is located near Malmesbury Abbey – which is known for its exciting shopping opportunities. It is important to know that while the Old Bell Hotel attracts many people, it is known to attract more than the living. In this guide, you will learn about the ghostly tales that surround this haunted hotel in England. Identified as one of the most haunted hotels in the entire United Kingdom region, many paranormal investigators have succeeded in concluding that there is, in fact, evidence of ghosts in and around the structure. As a matter of fact, there are believed to be many different ghosts at the Old Bell Hotel. The most famous of all the spirits in the hotel is a lady that used to work in the structure as a linen maid. She performed this job when the haunted hotel was actually a fully functional coaching inn. Her position consisted of removing the dirty sheets from the beds of the guests, replacing them with clean sheets, and then cleaning the dirty sheets so that they could be reused. Her name was Mabel. Mabel was a young lady with a pretty face. While many men had an interest in her, there was one man that caught her eye and her heart. The two were lovers for quite some time. One day, a recruitment drive was held in the region and several soldiers entered the bar of the Old Bell Hotel and started buying drinks for those that they could use in their army. The man that she loved was one of these men. He listened to the propositions of the soldiers and decided that he would like to be a part of the army of men that the King was gathering. It was shortly thereafter that he left and was part of a war of the time. Unfortunately, he died in battle. Mabel was devastated to hear of her loss. Shortly thereafter, she received news that she was carrying her lover’s child. This news came almost as quickly as the story of her lover’s life being lost in the war that he fought in. Mabel was completely taken over with grief. It was not too long after that she went into room six of the Old Bell Hotel and committed suicide by hanging herself. Since then, many strange situations have occurred in the room. Employees have arranged items in certain ways in the room, stepped out of the room, and returned to find those items in a different order. Many people that have stayed in the room have reported that their clothes have been folded and their belongings organized – despite the fact that none of the employees performed these actions. In one instance, an employee took pictures of the room and other areas within the haunted hotel on their cell phone and found an amazing image in one of the pictures. It was an image of a pretty young female believed to be the grief-stricken Mabel. The next story of this haunted hotel involves a young boy that experienced complications associated with asthma in life. He was the son of the person that acted as the landlord during his lifetime. This was reported to have been during the period of the 1930s. One day, the man heard his son suffering terribly from an asthma attack. He could tell that this attack was extremely difficult and that he was very challenged by it. When he went to the room where his son was having the attack, he witnessed a lady bending over him, seemingly consoling him. She was dressed in garments that appeared to be common during the 18th Century. She was simply patting his son on the back region of his body and when the landlord saw her, she disappeared right in front of him. This was not the only ghost story associated with a lady wearing 18th Century clothing. There was once an incident in the exact room that the landlord found his asthmatic son in approximately twenty years later. In the 1950s, the room was used as a nursery. The wife of the landlord of this time period was using the nursery to change the diaper on her child. She had to turn away from the child for a short time in order to get some diaper accessories. When she turned to face her child again, the ghostly woman stood looking over the baby and acted as if she was going to pick the infant up. However, just seconds later, she disappeared. It is believed that this is the spirit of a serving girl by the way she is dressed and the fact that she is typically seen when children are present. It is believed that she may have been murdered by a group known as Jacobites in the year of 1745. As you can see, there are many stories surrounding this haunted hotel. The Old Bell Hotel is the oldest and the most haunted of all hotels in the England area. There are many unique witness accounts and stories surrounding this particular establishment. If you are in the United Kingdom and are interested in experiencing the ghosts of the Old Bell Hotel for yourself, you should stop by this establishment. One thing is for sure, if you come at the right time and have the right equipment, it is likely that you will be able to experience the ghosts of this haunted hotel for yourself. Check for the lowest price, get directions, view photos, and read the reviews and traveler tips for the Old Bell Hotel.